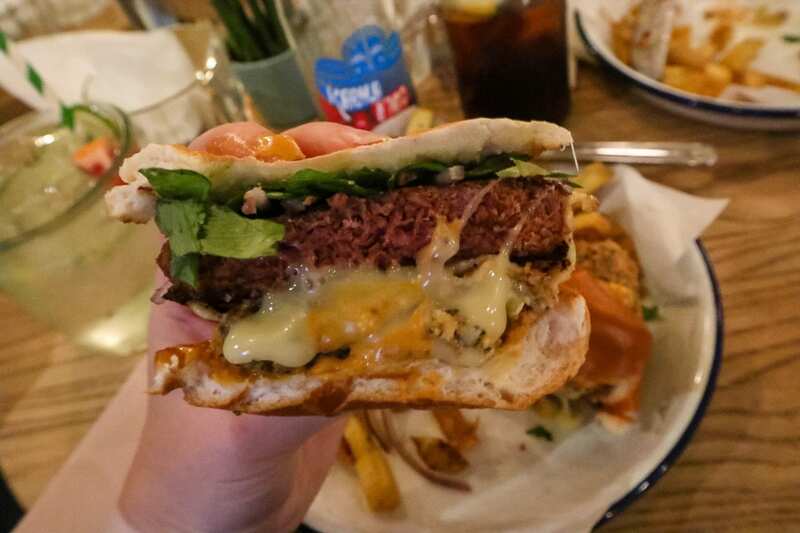 Despite the fact that I eat at Honest Burger in Reading a few times a month and absolutely haven’t ever found a vegan/plant burger I love more than theirs, I’ve never written about it on here. I even went to a media event at the end of last year along with some other local Reading folk, and still, haven’t gotten around to writing about that either. There’s no reason why, I just wasn’t sure how to begin writing about the evening, and sometimes when I want to do a good job of something I procrastinate for so long! Anyway, it’s Sunday and I’m on the sofa in my pj’s and because my boyfriend is torturing me by watching football all afternoon I’ve opened my laptop, stocked up on some chocolate and, well, here we are. I remember when Honest opened in Reading last year and I wasn’t that excited about it at all. To me it was just another burger joint jumping on the bespoke burger trend. No biggie. I’m not a big veggie burger fan you see. I don’t eat meat (which I think you all know by now) so I didn’t venture over for a few months after it opened. Then, I heard about this new vegan burger they’d launched using Beyond Meat patties and Steve was really keen on trying, so over we went. Now, I’m not usually keen on meat substitutes. I find them a bit ‘icky’ and because I don’t like the taste of meat, eating something that’s pitched as tasting like meat just feels wrong. I can normally manage a couple of mouthfuls before I’m done. So, I wasn’t too enthralled about the idea that Honest’s new vegan burger apparently had a delightful shade of pink in the middle and tasted ‘just like the real thing’. I just couldn’t get my head around why I liked it so much. Was it because it smelled so nice. Kind of like that summer BBQ smoked smell or because it actually arrived hot, and fresh. The ultimate balance of flavours, textures and deliciousness had me totally converted. Either way, I enjoyed it so much that now I crave them way too often! Priced at £11.50 it comes with the legendary rosemary salted chips. Oh, and you can double up for an extra £3.50. The patty itself is made from peas, potato starch, coconut oil and beetroot. The burger is then topped with Chipotle mayo which comes from London’s sustainable food brand Rubies in the Rubble. All stuffed inside a perfect brioche bun the ‘cheese’ is smoked vegan Gouda and then you’ve got pickles, red onion and a stack of lettuce – because is it a burger without the lettuce? A two-handed, messy, roll up your sleeves affair that you can really get stuck in with! The pink isn’t at all like it was described in the press release. In fact, it’s just a tad pink and that’s purely from the beetroot. It certainly doesn’t ooze like they said. I have no idea who would write such a thing…but I’m pretty sure they can’t be vegetarian or vegan! When it comes to ordering extras, I personally love the onion rings. If there was one thing that would make it better, it would be amazing if there were a few more veggie/vegan starter options. Every time we go we always end up on this subject, and suggestions have ranged from buffalo cauliflower, mac n cheese, to sweetcorn fritters. Anyway, horses for courses…the plant burger is AMAZING. There’s a relaxed atmosphere, great music, cocktails, fresh juices, local beer (different in every Honest), friendly enthusiastic staff, but more importantly; you can always get a table. Always! Claire from Explore Reading invited me along to this one and already being an Honest fan meant I was instantly interested in attending. Especially when Claire told me the two founders, Tom and Phil, would be coming along to give a little talk on how they started Honest and how they reached a point where they now have 30 restaurants across the UK. Honest was initially launched as a way to escape the 9-5 rat race and despite a few funny tales about chip disasters, trying to cook in the rain and against gale-force winds at a bonfire, and then spending all their cash on meat, you can’t help but admire and feel Tom and Phil’s passion for what they do. We listened to them tell us about how they started back in 2011, where their inspiration came from, the struggles and hurdles. What catering at Glastonbury was like and what they have planned for the future. Tom used to be in the kitchen whilst Phil would wait on tables. With no formal training they worked hard, they made mistakes, they put them right and they kept getting better. They’ve a certain energy. They act like brothers and best-friends and admit they are both still very hands-on despite having to hand over over some of the bigger business decisions to their private equity investor. I get the impression that despite how big they may become, there’s a couple of things that will never change; their values, philosophy and the quality of the menu. Tom and Phil were adamant that they want everything on their menu to taste homemade, with no shortcuts. I didn’t have any idea that they make so many things in-house. The chips, the relish, the lemonade, the pickles. Even the meat patties are made in their own butchery! All those burger restaurants that don’t have a good vegan option are missing a trick. I wouldn’t have become such a fan if it wasn’t for this particular plant burger. I’m also pretty sure there are lots of other veggies and vegans that feel the same. All restaurants need to cater to all food preferences, and in a more imaginative, less boring tasty way than quite often done. Carnivore, Vegetarian or Vegan…if you haven’t been to an Honest restaurant yet, you’re missing out! Have you tried the Honest plant-burger? What did you think? Would you be tempted to try even if you’r a meat eater? If you’re looking for more vegetarian or vegan options in Reading – then this post is perfect for you! "(AD) The Red Lion Restaurant Review"
No way. They ruin everything!